Director/Screenplay – M. Night Shyamalan, Producers – Marc Bienstock, Jason Blum, Ashwin Rajan & M. Night Shyamalan, Photography – Michael Gioulakis, Music – West Dylan Thordson, Visual Effects – Powerhouse VFX (Senior Supervisor – Edwardo Mendez, Supervisor – Ruben Rodas), Special Effects Supervisor – Patrick “Squares” White, Makeup Effects – Mike Maddi, Production Design – Chris Trujillo. Production Company – Blinding Edge Pictures/Blumhouse Productions. 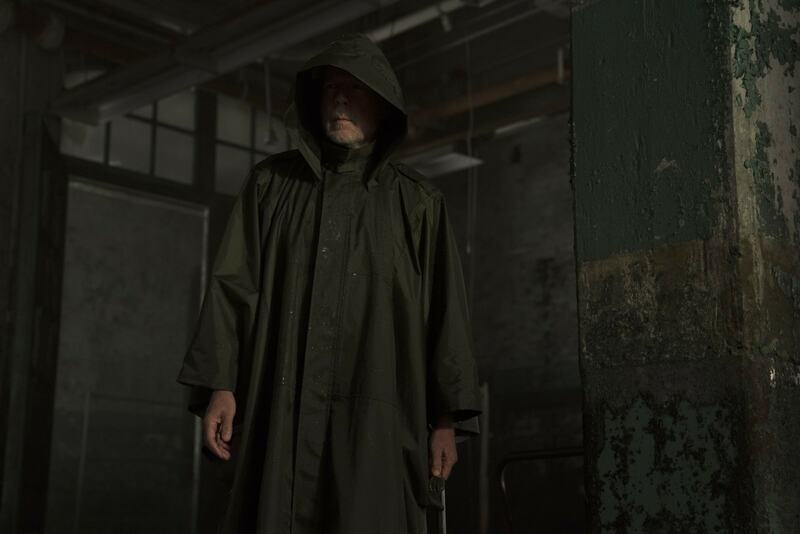 In Philadelphia, David Dunn has been operating as a hooded vigilante for the past nineteen years aided by his son Joseph on technical support. This has made him sought after by authorities. At the same time, the multiple-personalitied Kevin Crumb has been abducting girls. Joseph triangulates the attack patterns to deduce where Kevin is working from and David breaks in and rescues four abducted cheerleaders. This results in a furious fight between David and Kevin’s personality known as The Beast, which is interrupted as armed authorities arrive. Captured, both David and Kevin are locked up in the Raven Memorial psychiatric institution under the care of Ellie Staple, a psychiatrist who specialises in treating people who have the delusion that they are superheroes. They are held in cells, David contained with high-pressure water blasts, Kevin with lights flashes that cause him to switch personalities when he becomes too aggressive. Also present at the facility is Elijah Price. Ellie tries to convince the three of them that they are delusional about their abilities. However, Price creates an alliance with Kevin and conspires to breaks him out, wanting to make an attack on the opening of a downtown tower so as to announce their existence to the world. M. Night Shyamalan is a love him or hate him director. Shyamalan had a massive runaway hit with his third film The Sixth Sense (1999), a film that altered the nature of the genre for some year after – today we still have ghost stories and supernatural films that have to come with some conceptual reversal twist ending. Shyamalan found himself being pigeonholed by the conceptual reversal twist in his next films Unbreakable (2000), Signs (2002) and The Village (2004), all of which were made in secrecy with a publicity campaigns built up around revealing what the films were actually about. Audiences still gave Shyamalan goodwill up until the giant shaggy dog ending of The Village. It is after this point that the Shyamalan backlash began through the likes of Lady in the Water (2006), The Happening (2008), The Last Airbender (2010) and After Earth (2013), as well as the Shyamalan produced The Night Chronicles 1: Devil (2010). Shyamalan himself rebelled against a studio insistence on big conceptual reversal endings but audiences continued to slam him for his hokey ideas and big-headedness (like casting himself as a great writer in Lady in the Water), although in many of these cases I will happily defend the works as being of more interest than most gave them at the time. M. Night Shyamalan is one of the few artists who managed to obtain a career second wind. While the consistently terrible notices and box-office of films like The Happening, The Last Airbender and After Earth would be enough to sink the career of another director, he smartly bounced back by teaming up with Blumhouse who have made a meteoric rise since 2010 with films such as Paranormal Activity (2007), Insidious (2010), Sinister (2012), The Purge (2013) and various sequels to these, among others. Operating on one of Blumhouse’s economy budgets (usually under $5 million), Shyamalan made the witty Found Footage film The Visit (2015), which gained some great notices, and then Split (2017), which received more great notices and also became a runaway box-office hit. Split concerned split-personalitied James McAvoy who abducts and imprisons groups of girls (including Anya Taylor-Joy). The surprise about the film was the final scene where Shyamalan included a cameo from Bruce Willis intended to connect up to the character he played in Unbreakable. Unbreakable was a film in which Willis played a regular security guard who was the sole survivor of a train crash before being convinced by Samuel L. Jackson that he was a comic-book superhero. Shyamalan revealed that he had always wanted to add the character of Kevin to Unbreakable but could never find a way to do so in the script. Thus he created his own film around the character. Glass is a sequel, which merges the characters from ‘Unbreakable and James McAvoy’s split-personalitied killer from Split into what is effectively a shared universe. Unbreakable was an anti-superhero film where Shyamalan spurned superheroics and costumes and made a film that worked in mundane, kitchen sink terms. Of course, in between Unbreakable and Glass, there has been a huge upsurge in superhero films. At the time that Unbreakable came out, the Marvel Cinematic Universe was not around – the only glimmerings of what it would become were Blade (1998) and the first X-Men (2000) film that had been released four months earlier in the year. I suspect if it were not for the success of the MCU and Marvel bringing their superheroes together in The Avengers (2012) and subsequent works, that Shyamalan would not have been able to get Glass made. In the same way that Unbreakable was an anti-superhero film, Glass is in effect the anti-Avengers film. 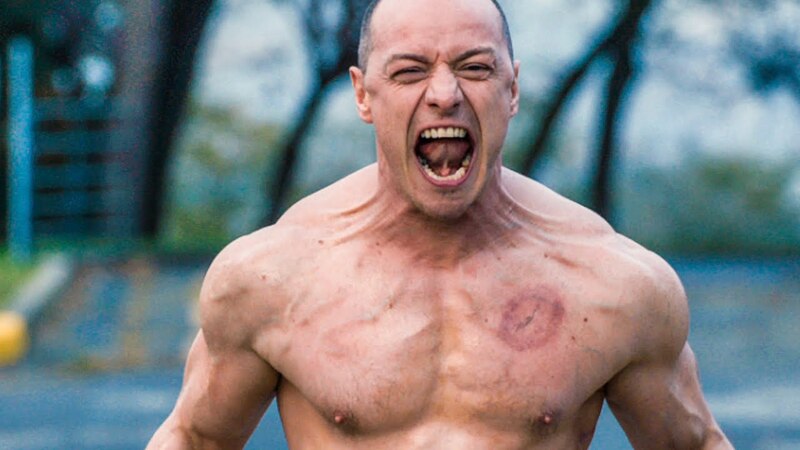 The superheroics remain relatively mundane, slightly more fantastic than they were in Unbreakable – some scenes with James McAvoy scuttling around on ceilings and Bruce Willis kicking down a metal door, or McAvoy and Willis throwing a table about, before reaching a climax with the two of them punching each other around outside the hospital. This is notable in contrast to the way MCU handles things – the fight scenes here never get too fantastical or reliant on effects, in fact could easily pass muster in a regular action film. There’s the threat of an attack on the opening of a building but where Marvel might well have a tense countdown as the heroes fight before reaching a massive explosion, all of this only takes place off-screen and the bomb is never detonated. For all that, Glass doesn’t quite work. Shyamalan’s mistake is to pair Bruce Willis and James McAvoy off as nemeses only to then have the showdown over and done with fairly early on and the two of them then incarcerated in an asylum for the bulk of the running time. Willis ends up being sidelined almost until the end of the film. James McAvoy ends up dominating the show with a series of rapid change flips between personalities but even then you feel like he is not used to his best advantage. Samuel L. Jackson does emerge as an evil genius in the later stages of the film but again you wish he had been given more to do. Instead of allowing the characters to come out and shine, Shyamalan gives us Sarah Paulson who introduces herself as a psychiatrist who specialises in treating the delusion that people are superheroes – although the film does nothing to establish why this seems to be such a widespread delusion that you need experts in the field. (Nor exactly do you think some of her methodology, which includes blasting patients with high-pressure hoses, inducing rapid flipping of multiple personalities with stroboscopic lighting and conducting experimental neurosurgery, would exactly be techniques recommended by the American Diagnostic and Statistical Manual). After her introduction, the middle of the film drags down into a series of scenes where she tries to convince Willis, McAvoy and Jackson that being a superhero is a delusion. (In the case of McAvoy, he actually has to be convinced that he believes he is a superpowered character first before being convinced it is a delusion). This is following on from Unbreakable and its rendering the superhero in kitchen sink realism. 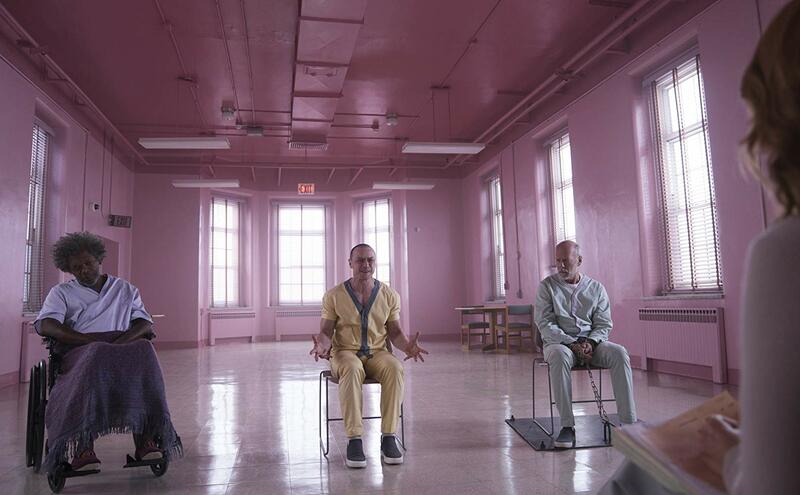 However, this idea of the existential superhero doesn’t quite inspire – Shyamalan’s philosophical musings are not where we want the film to go, what we want is to see Bruce Willis, James McAvoy and Samuel L. Jackson battling it out rather than imprisoned in an asylum and being taught to doubt their own existence. The result ends up neither being as epic nor as interesting as Shyamalan seems to want it to be.